This 3D Orthodox text written in blue on the "parchment" background. The illumination made with, Roses, Calla Lilies, Sunflowers and Bluebonnets which are painted on left of the text. 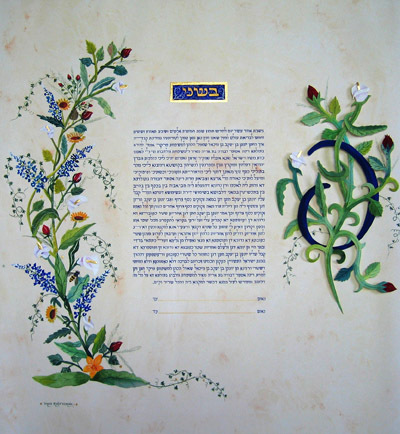 The cursive Hebrew letter פ - "Peh", is the initial of the couple's family name, and was done in the Paper-Sculpture technique. The Calla Lilies are done with 23K Gold Leaf, and the fine Ivy painted directly on the paper. The date of the wedding above the text, in 23K Gold Leaf framed box.